You never know what lies ahead as you head to your fishing holes. Today we conclude the series with a pic that to me is a visual representation of the beginning of every fishing trip. No matter terrestrial approach as displayed here or chasing those fish via watercraft, the concept is the same. Before you venture into somewhere out there, there’s a degree of preparation and planning for what you feel may lie ahead. But in actuality, anything can happen which is all part of the fun. But at the moment represented in our final pic, here frozen in time, hopes run high, the heart beats a little faster and a smile graces the face. The image still does all of those things as I sit here typing while letting my mind wander to thoughts of the next time I get to take that initial step into that world. Today’s title, lyric and feelings also apply each time I find myself in front of a clipboard or a keyboard. Thus we conclude the “Blog Banner” series, thirty up and thirty down. An exercise in explaining what the outdoors means to me via some words behind the photos. All in the name of conveying the title and tagline that reside just above those 30 pictures that I call the Blog Banner. I’m going to leave the current one around for the rest of the month before another change of blog scenery, thinking perhaps a bit more retro outdoor theme. We’ll see. 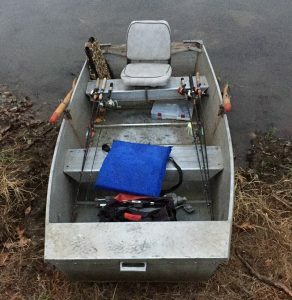 I’d say that this post details how a boat looks at forty but no one really knows the age of this old faithful watercraft. Its true origins are unknown, says so right on the registration, which is pretty cool. Adds a little character. The origins of it becoming “our little boat”, however, are known. Dad and a friend found it completely submerged while clearing a log jam on a creek in Henderson County, IL over forty years ago. Adds a little more character. And, as the saying goes, the rest is fishing history. As the above lyrics reference there are a few minor leaks but I suppose that’s to be expected. After all, that thing has been hauled thousands of miles in the beds of trucks, drug over all types of terrain, launched on ramps of gravel, grass and concrete, rowed over ice, pushed over logs, pulled through shallows, rained in, snowed on…you get the picture. It’s outlasted a few sets of oars, a couple boat seats, numerous poles, lures, tackleboxes, lifejackets and anchors. The outdoors is a wonderful place. So is a kid’s imagination. And when those places collide…well, it’s quite an adventure. 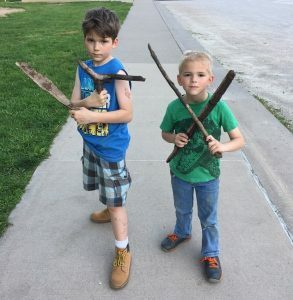 The wooded ravines of Wildcat Den State Park in Muscatine County, Iowa were a bit safer on this day thanks to a pair of martial artist brothers. Not only were their hands considered lethal weapons but they also managed to collect several other weapons from nature’s stash. Who knew that lying trailside amidst the towering bluffs, along the running streams and beneath the forest canopy one would find such an arsenal? Sadly, not a fifty year old guy more concerned with the flora, fauna and geographical features of the site. But you know, those young imaginations are more than a bit contagious. This shot was included in the Blog Banner as an example of a weird accident turned trivia opportunity that wasn’t noticed until taking a closer look at the pic after the trip. These days we do have the welcome feature of immediate feedback on digital photos but I generally just give them a quick glance. I make sure the shots are in focus and that my lighting is acceptable before giving it the okay and letting the fish swim away. In the case of this shot, it was not a particularly impressive bass but it was my first of the evening which calls for a picture. After all, while you intend to add more to the log, you just never know when those fish will get stingy and leave you without another bite. Since taking up blogging, the first fish shot has become a habit just for such a reason. Upon having a closer look when compiling my fishing report I couldn’t help but chuckle a bit at the “antennae” protruding from my floppy hat courtesy of one of the electrical towers in the background. The photobomb immediately made me think of the old sitcom My Favorite Martian that used to run in rerun on weekday summer afternoons as a kid. I was never what you would call a fan as I was more of an outdoor kid but I saw enough to get the character of Uncle Martin lodged somewhere in my brain. And there you have it, another fun bit of once useless trivia put to work all of these years later in an outdoor blog. The actor who played Uncle Martin had a later role that hit closer to my generation. It was none other than Ray Walston who portrayed History teacher, Mr. Hand, in the classic 80s comedy, Fast Times at Ridgemont High. Well, wait a minute. I guess I need to check out one more definition. Yeah, that also fits the bill on a buzzbait catch. Anyway, I buy these off the rack just like most of us fishing folk. For my money they are just right as the price is reasonable for one thing. Many places you can find them for under $5 and after a couple good strikes I’d say the bait has returned your investment. Of course, they last much longer but the rest is just icing on the cake. 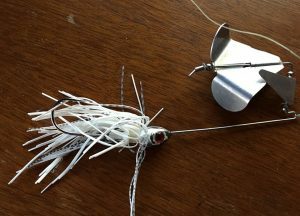 The second aspect that is a winner is the fairly brainless nature of a buzzbait retrieve. Now you’ve got to be tossing it in the right places but once you identify such locations it’s basically cast it out, reel it in and get comfortable on the edge of your seat. A few quick tips though before I let you go. I find that a longer rod is a must to get the most effect and distance out of your casts (I use a 7’ Medium Heavy/Fast Action model). I want to throw it as far as I can around those fishy looking spots in order that it makes as much commotion for as long as it can on the way back to the boat or bank. A high gear ratio reel helps to keep the bait moving and picks up slack in a hurry to begin the retrieve once the bait hits the water. I only use a 6.2:1 so could definitely step it up to ease the workout but it is what I’ve got and I make do just fine. Final note, don’t set the hook when you see the strike but wait that split second to feel the fish. Easier said than done and takes some practice. 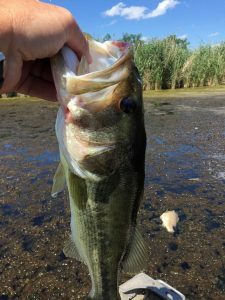 While we won’t be tossing buzzbaits anytime soon around here I thought this post provided a good opportunity to educate beyond the earlier vocabulary lesson. The education aspect is a feature that I hope to delve into a bit more as 2019 progresses. Anybody remember the Addams Family? 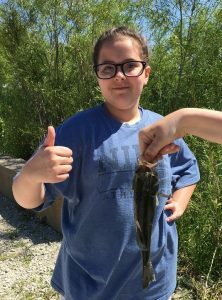 Well, that’s not Thing giving our youngest daughter, Carly, an assist with her bass but instead it’s her younger brother, Jayce. He’s much more in tune with handling the catch. In fact, he can hardly wait to get a hand on a fish no matter who is on the catching end. When it comes to catching though, Carly will give that boy a run for his money as the most prolific fishing kid. A scan of the outdoor photo collection shows her with a bluegill on the end of a Mickey Mouse pole a month shy of turning two years old. Carly also holds the unofficial kid species record with a collection of bluegill, crappie, bass, green sunfish and redear. She seems to have a knack for the latter of that bunch, prompting a previous blog entry for the original Blog Banner series entitled “Redear Queen” (click here). I definitely give this pic a thumbs up just as Carly is doing with one of her two free hands. Hey, no harm in getting by with a little help from your friends (or a sibling). Heck, I used to fish with a Golden Gloves boxing champ in high school, toughest dude around, who either used a leather glove or had me unhook his fish. True story, and he was also afraid of worms. But those are tales for another day, if I ever decide to risk the reveal. How appealing does this picture from a summer day look to anyone else who is tired of a full blown Midwest winter? Beyond the sign lies a wonderful world of discovery for our young crew and a reconnect for their folks. Back in the 90s and early 2000s, before Julie and I tied the knot and later found ourselves responsible for four kids, we used to spend a fair amount of time roaming the outdoors. Field guides in hand we prowled numerous Illinois state parks from the home base of a much smaller tent than what is required nowadays. Johnson-Sauk Trail State Recreation Area near Kewanee, IL had made the cut back in the day making it even more fun to revisit and view through the eyes of our offspring. As expected, the park did not disappoint with nature’s pallete of greens, yellows, reds, purples, and oranges all catching our attention. The plants bearing those colors included tulip tree, jewelweed, trumpet creeper, Joe Pye weed, tall bellflower, cup-plant and one of my favorites, bergamot, all of which we demonstrated identifying with our field guides in tow. Now, winter’s been a rough one around here, but sooner or later those woods will spring to life yet again during another act of nature’s fascinating annual play. Keep your eyes peeled for the stars of the show such as trillium, Jack-in-the-Pulpit, mayapple, bloodroot, violets, phlox and more. And if your timing and eyesight are right, perhaps you’ll cross paths with a generally highly regarded springtime fungal treasure known as the morel. Ah yes, the wonderful world of technology and its effect on my hobby. Plenty of things that we take for granted never even entered my mind back when I started chasing bass in the 1980s. Blogging for instance, or even the internet for that matter. Heck, I had to wait for the October 1984 issue of Bassmaster to find out that Rick Clunn had captured his third Bassmaster Classic title in mid-August of that year . Nowadays, in a couple weeks I’ll be able to track near realtime catch and weight data, read up to the minute blogs and watch the live daily weigh-ins from the Bassmaster Classic on the computer in my living room. Or better yet, on my phone, from anywhere. Which brings me to today’s Blog Banner picture which is actually a screenshot. So, my brother, Brent, and I are roaming around some Knox County strip mines last April doing a pretty good number on the bass. Well, as he lands a few good ones I fire away with the camera which is actually part of a phone these days. And it’s not good enough to simply store the pics on the phone which boasts a storage capacity that was unheard of on personal computers not too awfully long ago. Nope, you’ve also gotta boast a bit to the fans at home. Instant feedback via texting rather than having to take your film in for processing before it can find a home on the local baitshop counter or bragboard. Instant feedback indeed in sending a note and picture from the middle of nowhere to Mom, Dad and Julie to keep them up to speed on our results. I’ve gotta say that while sometimes I have about all the tech I can take, the ability to send out on the spot fishing updates is still pretty cool. For this outing, Brent’s 2-12 would stand as Top Bass, besting my best bass by exactly one pound. 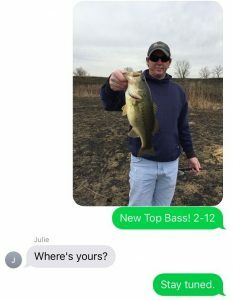 Looking back I have to laugh at Julie’s response of “Where’s yours?” as it confirmed that I was once again getting outfished by my younger brother. My reply of “Stay tuned” conveyed that I still had high hopes but in the end I couldn’t effectively provide her with a suitable text and pic reply. 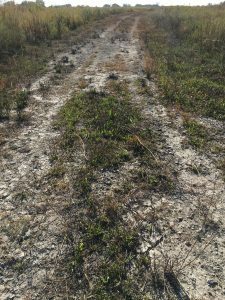 Back in 2006 I wandered well of the beaten path at some public strip mines and found a few bass in a secluded lake partially surrounded by a grove of locust trees. Since it didn’t have a name on a map, I christened it Locust Lake. 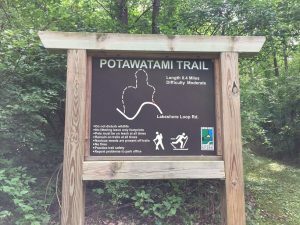 For the next several years I made a handful of visits and even managed to portage a boat into the spot on a couple occasions. It was a decent fishing hole in terms of numbers and worth the effort to reach. However, I could never find any heavy bass that I suspected called it home. Closest I got was a big bite that busted off my Mann’s Baby 1- crankbait one afternoon but I never got a look at the fish. But I’ve done this long enough to know that not only was it a good fish but also that it could be as big as the story I chose to tell. Fast forward to the summer of 2017 and I finally got my look at what might have been on my line, actually several examples. All floating on the surface as I crested the rise that effectively hides the lake. The collection of dead fish, including several bass in the four pound range, was an unfortunate explanation for the foul stench that permeated the air during my approach. Having put forth the effort to haul in my little boat, I decided to give it a go for old time’s sake to see if I could find any survivors. 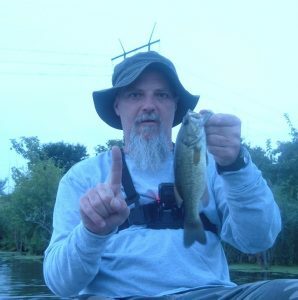 The picture above from the Blog Banner was one of three bass that came aboard in a couple hours of rowing around the rotting fishing hole. It measured 17.5” and tipped the scales at a sickly weight of only 1-13. I was surprised it even had enough left in the tank to bite and I remember at the time thinking that I didn’t really even want to lip it as it looked almost infectious. While such catches just don’t show up for me every trip, 2017 was a pretty solid year. So this fish definitely deserved a spot in the Blog Banner as it was fooled during the time period designated for this collection of photos. And yes, I will admit that much of the purpose of the Blog Banner is to grab attention as that’s all part of the game for a website. Such a tactic is referred to as “clickbait”, a lure all in itself but not one that resides in a tacklebox. No deceit here though as my posts deliver what the pics represent and that’s what this whole Blog Banner series is laying down. This fish is just another piece of that message as it is actually a big bass and not some sort of internet photoshop trick. I wouldn’t pull such a stunt as this blog shoots straight and reports weight (5-9 on this 22” bass). Catches of this size are also fun in the age of the selfie as they make you wonder if your arm is going to be long enough to capture the whole fish in the frame. 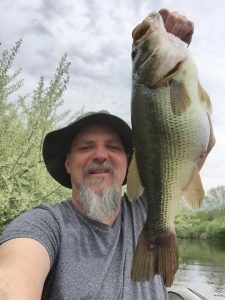 Another note on fishing pics is that if you elect to put your mug in the shot (and I think you should), don’t forget to put a smile on your face. Looking back over 50 years of family outdoor pics, I’m proud to say that most all of them have some happy looking outdoor folks in them. Of course, if I luck into one this size that grin is kind of automatic. Pretty much lasts all day too. In fact, it brings a smile as I type up this blog entry nearly two years later and I imagine that it always will.